Ian Perkins is the latest in a long family line to inhabit the remote Cobweb Cottage, which sits in the shade of a sycamore tree that has reputedly cursed his family for generations. Tragedy – the suicide of his elder brother – was the catalyst that made Cobweb Cottage his, and he lives there now with his wife and young son. But all is not well with Ian Perkins: his marriage is on the rocks, his wife avoiding him as much as someone can in such a small space. And he has become obsessed with the so-called family curse, determined to get to the bottom of it, to prove that it exists, as a way of repairing his broken family. Broken Branches is an intense and often difficult book to read. It is, essentially, a tale of obsession, and we watch helplessly as Ian’s life is consumed by his quest to prove the family curse is real. It is also one of the creepiest book you’ll read this year, as Ian Perkins comes face to face with his past, and the disastrous past of this house, which has been in the Perkins family for generations. Without knowing why Ian is obsessed with the piles of paperwork that have accumulated in his study, it’s difficult to empathise with a course of action that seems to be destroying his life, but we don’t need to empathise with him; we all understand the pull of obsession, the strange need to know, or to have, or to be, whatever that almost-achievable goal might be. So it’s easy to go along with the flow, to wonder why his wife is so cold and so distant, as he puts first his job, and ultimately his own sanity on the line in order to find the pattern that he knows is buried within his family tree. When we find out why he is so driven – and I’ll be honest, it’s a suspicion that comes upon the reader suddenly about halfway through the book – everything becomes clear, and we begin to wonder if he’s not the most sane person we’ve ever met. M. Jonathan Lee forces the reader to examine their own conscience, and ask ourselves whether we might not do the same thing in Ian’s shoes: if the most terrible thing that has ever happened to your family could be proven to be predestined – not just within your own brief lifespan, but for over two centuries – could you forgive yourself and shrug it off and, more importantly, could you convince those you love to do the same? It’s difficult to talk about Broken Branches without looking at the tragedy that lies at the heart of the story, so apologies for the vagueness, but there’s a fine line between writing a review of such a complex novel, and giving away all its secrets with a misplaced word or sentence. Suffice it to say, while it’s an examination of Ian’s slow descent into madness and depression, it’s presented as an old-fashioned horror story. Ian spends much of the novel alone in the remote Cobweb Cottage, which we know has seen many tragedies over the generations, and Lee shows immense talent in lulling the reader into a false sense of security before performing the literary equivalent of the cinematic jump-scare and leaving us to peel ourselves from the ceiling before we can continue…or wondering whether we should go to bed and leave the rest of the book until it’s much brighter outside. 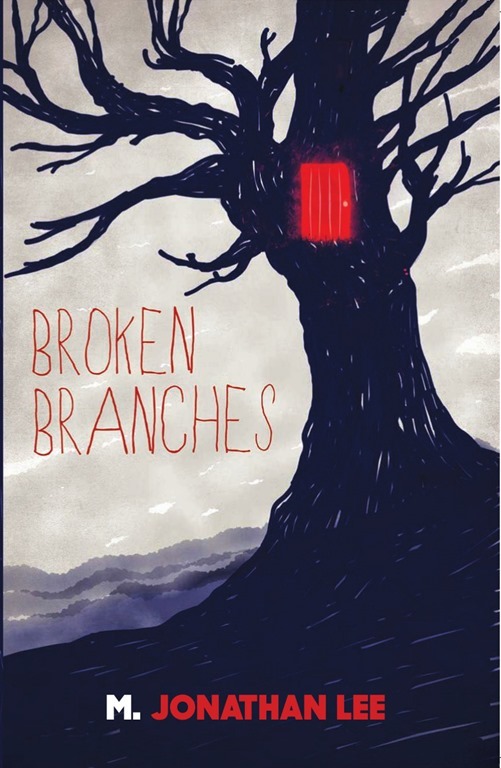 Despite the slow pace and the fact that, in the end, nothing much actually happens, Broken Branches is difficult to put down once you’ve picked it up. Lee gives us unfettered access to Ian’s life, as we watch him grow from a child to an adult, and see how his relationship develops with his family, his elder brother and his parents, all of which goes some way towards explaining the man he is now, and the drive he has to discover whether the family curse is a real thing, or just a story passed through the generations. From the moment we learn of it, we have to know what this curse is, and what the result of Ian’s investigation is. And we approach that result with a sense of dread – regardless of the outcome – because the result cannot change what has already happened. Dark, intense and often frightening, M. Jonathan Lee’s Broken Branches is an examination of a man, and a family, slowly falling apart. While it may not be classed as a horror novel, it certainly has all of the elements to make it one of the finer examples of quiet horror you’ll come across this year. Bleak as it is, it’s a beautifully-written piece that sticks with the reader well beyond the last page. Not to be missed. Thank you so so much for reading my work and putting together such a well written and thoughtful review.